The 2,000 Guineas Stakes, which will be run for the 211th time in 2019, is scheduled for 3.35pm on Saturday, May 4. As usual, the first colts’ Classic will be run over a mile on the Rowley Mile Course at Newmarket and, if the current ante-post market is to be believed, looks a foregone conclusion. The market is dominated, as it has been throughout the winter, by the Champion Two-year-old Colt of 2018, Too Darn Hot, who is available at just 6/5 to maintain his 100% record. Bred and owned by Lord Lloyd-Webber and trained by John Gosden, the Dubawi colt didn’t see a racecourse until August, but did everything asked of him as a juvenile, in taking style. He raced four times over a mile and 7 furlongs, without ever being fully tested and culminated with an easy, 2½-length win over Advertise in the Group One Dewhurst Stakes, over 7 furlongs, on the Rowley Mile Course in October. His Timeform Annual Rating, of 127p, was 7lb superior to any other European juvenile and, having won on good to soft, good and good to firm going, appears to have an outstanding chance. John Gosden recently reported him ‘where I want him right now’ and the plan is to run him in the Greenham Stakes, over 7 furlongs, at Newbury on April 13 en route to Newmarket. Of course, the Clarehaven Stables handler could also be represented in the 2,000 Guineas by Calyx, who was, himself, ante-post favourite before being sidelined with a bone injury, but can now be backed at 11/1. 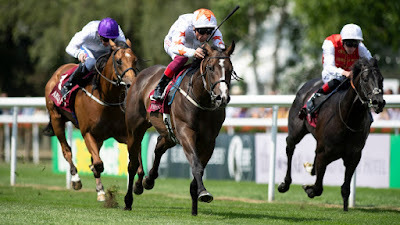 Bred and owned by Khalid Abdullah, the son of Kingman was restricted to just two starts as a juvenile, but won both, including the Coventry Stakes, over 6 furlongs, at Royal Ascot, which he won impressively, albeit by just a length, from Advertise. Although unproven beyond 6 furlongs, he was the joint-second highest rated juvenile of his generation, alongside Ten Sovereigns, according to Timeform. However, hasn’t been seen in public since last June and, while he’s reportedly wintered well, his participation at Newmarket remains in doubt, so Too Darn Hot looks a much safer option at this stage. Speaking of Ten Sovereigns, the No Nay Never colt was also unbeaten in three starts as a juvenile, all over 6 furlongs and including the Group One Middle Park Stakes on the Rowley Mile Course. His trainer, Aidan O’Brien, has stated that ‘there’s a good chance’ Ten Sovereigns will stay a mile and, granted his powerful Coolmore connections, it would be foolhardy to write him off. However, the 8/1 currently available about him makes an only limited appeal against the proven form of Too Darn Hot, who has a touch of star quality about him. Having wrested the Flat trainers’ championship back from Aidan O’Brien last season, with two months to spare, John Gosden has made a bright start to 2019, with 19 winners from 51 runners, at a strike rate of 37%, and should have plenty more to look forward to in the year ahead. Although hardly an original selection, Too Darn Hot appears to have few, if any, negatives against him at this stage and looks a worthy favourite.